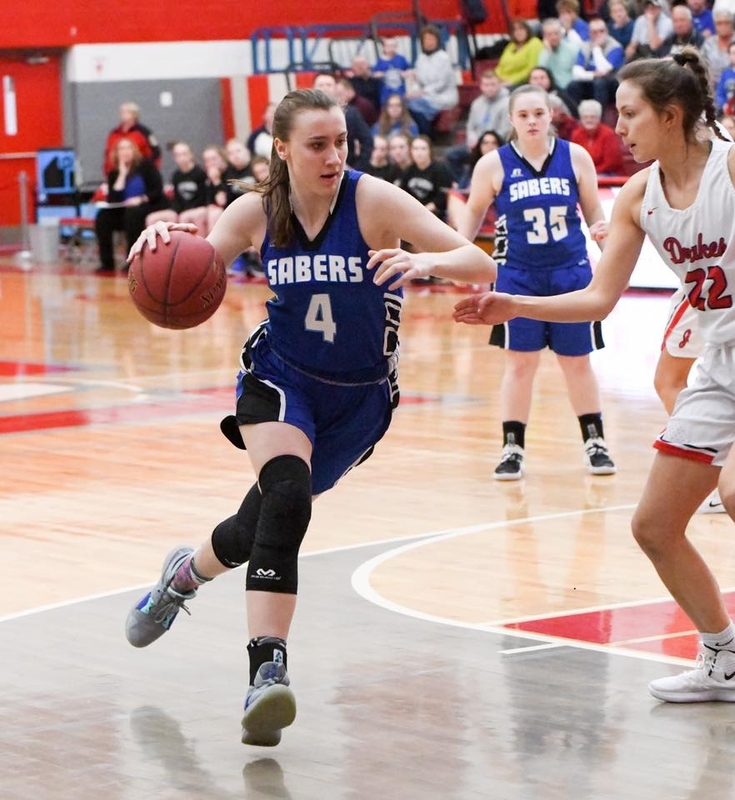 March Madness is a roller coaster of highs and lows and the Susquehanna Lady Sabers finished one heck of a ride on Saturday. The team has made the past few seasons historical and added a new chapter to the book continued Wednesday night. Overcoming the foul trouble that plagued leading scorers Taylor Huyck and Mackenzie Steele, senior Bethany Maby picked a great time to score her season game high total. She put 17 points on the board as Susquehanna won their PIAA second round game over Greenwood 46-36. The win advanced Susquehanna to their first PIAA third round appearance in program history. On Wednesday, Maby scored five of the team’s first eight points and added two assists as Susquehanna jumped out to a 14-7 lead. Unlike the first-round game the Lady Sabers were able to connect from downtown. Huyck nailed two three-pointers and Mackenzie Heath hit the first of her three treys to go along with Maby’s five points in the quarter. Susquehanna extended the lead to 19-7 in the second quarter as Maby went coast to coast off a defensive rebound and Heath nailed another jumper from behind the arc. Greenwood stayed within striking distance with a 7-2 run to trail 21-14 at the break. The Sabers held Greenwood to 30 percent shooting from the floor in the first half and senior McKenzie Rhone led by McKenzie Rhone who held the opposition’s leading scorer to one free throw. Stroup, who came into the night averaging nearly 20 points per game finished with only 7, most of them scored late. Susquehanna managed only three field goals in the third quarter, but all of them from behind the arc. Huyck, Heath, and Maby each connected the shots and pushed the lead to 31-20 before Greenwood made another end of quarter run bring the game within 5 points. But Maby was fouled on a desperation three at the buzzer and converted two of the three free throws to go up 33-26 to enter the fourth. Steele converted two quick layups to start the final quarter and push the lead to 11. Maby buried another three from 23-feet to push the lead to 40-26 with just over six minutes to play. From there Susquehanna converted two free throws and a couple field goals for the final score. Maby was aided in the scoring column by Heath who finished with 11 and Huyck chipped in with 9. Saturday found the Lady Sabers traveling to Hazleton High School to take on the defending Class A champion Jenkintown Lady Drakes. Susquehanna was undaunted with the task jumping out to an early 11-1 lead midway through the first quarter as they pounded the ball inside to Steele and Huyck. Jenkintown regrouped and cut the lead to 14-7 at the end of the first stanza. The Lady Drakes began to seize momentum in the middle quarters behind Carly Mulvaney who scored 13 of her game-high 21 points in the first half. Susquehanna was able to maintain a 21-20 lead going into intermission. Jenkintown turned up the pressure in the third quarter forcing six turnovers as they outscored Susquehanna 17-6. The Lady Drakes also pounded the offensive glass to earn some second chance points. Trailing 37-27 entering the fourth, Susquehanna mounted a rally with just over six minutes left on the clock. A Steele putback was sandwiched between a Huyck drive and two free throws to cut the Drakes’ lead to 39-34. Steele answered a Jenkintown score with four free throws to cut lead to 41-38. After another Lady Drakes score, Steele scored four straight to cut the lead to one, 43-42. Forced to foul, Susquehanna put Jenkintown’s Natalie Kolb on the line. The senior calmly sank two shots to put the Lady Drakes up 45-42 with 14 seconds left. Heath found herself open and her 24-foot jumper hit the back of the rim and caromed out. Jenkintown gained possession with a jump ball on the scramble for the rebound and Kolb hit two more free throws to eliminate Susquehanna 47-42 from the state tourney. Steele finished with 21 points leading Susquehanna and Hyuck added 15 on the night. Despite seeing their season come to an end, Fallon put things in perspective on how his team performed during their playoff run. “It feels like we had a team good enough to win a state championship,” said Fallon. Susquehanna will lose Maby and Rhone to graduation, which Fallon noted as a big loss, but is optimistic that this run will fuel the returning team members. Be the first to comment on "Lady Sabers fall in third round"